#81- BRENT LEWIS: Brent was an original Phoenix Outlaw in 1999 and retired in 2005. At the time of his retirement Brent had the most receiving yards in team history with 2,041 including the most receiving yards in the post season with 319. He finished second in touchdown receptions with 22. In a five year career Brent averaged 16.59 yards per catch. Brent Lewis scored the first touchdown in team history. Brent also helped out on defense recording 37 tackles including 29 solo. He also totaled 7 passes defended and 4 interceptions. While playing special teams he recorded 7 kickoff returns for 124 yards with an average of 17.71 yards per return. In the early years of Adult Amatuer Football in Arizona, Brent was the receiver that all players tried to emulate their game after. Perfect body type at 6'-2" and 208 pounds, and was known for running percision routs and scoring touchdowns. Brent was voted into the leagues All-Star game in just about every season and was All-League 1st team in 2002. Won multiple "Outlaw Player of the Week" awards. Played ball and graduated from Berry Goldwater High School and then moved on to play at Glendale Community College prior to becoming an Outlaw. #86- SAL ARMENDAREZ: Sal came to the Outlaws in 2000 and retired in 2005. In those five seasons Sal became the most decorated special teams player in team history. Sal totaled 30 tackles including 20 solo and 2 fumble recoverys. At 5'-9" and 180 pounds Salnever worried about his stature because he always played bigger than himself and was respected and loved by all his coaches and teammates. Played part time on offense providing valuable support at the tight end and widereceiver positions. Always one of the teams true warriors. In his five seasons Sal never missed a practice or a game. Made a memorable 21 yard catch between two Phoenix Hurricane defenders in a playoff game. John Polchin Sr. who coached the special teams for the outlaws in each of our first 7 seasons, has stated numerous times that "if I could ever give out a special team award it would automatically go out to Sal Armendarez". So it is more than fitting that our first special teams player being inducted into the Outlaws Hall of Fame is Sal. He spent 9 years in the U.S. Army including being a Desert Storm Vet. #20 - MICHAEL HENDERSON: Michael played for the Phoenix Outlaws from 1999 to 2004. An original Outlaw who during that time became the most feared runningback in the state. Has a build the coaches dream of... powerful with speed. If you tried to tackle him high, he would run you over, if you tried to tackle him low, he would hurdle you. Unbelievable vision who never looked at the first defender because he never stood a chance. Rarely tackled by one player. Finished his Outlaws career with 480 rushing attempts (1st in team history), 2,590 rushing yards (1st in team history), and scored 26 touchdowns on the ground (1st in team history). Michael also had the soft hands of a receiver out of the backfield and totaled 84 receptions for 639 yards and 7 touchdowns (all 1st in team history for runningbacks). Returned 4 kickoffs for 113 yards, and had 26 tackles on defense including a 3 sack game vs the Bulldogs on 2/13/1999. Class act that was All-League and a All-Star every season he played. 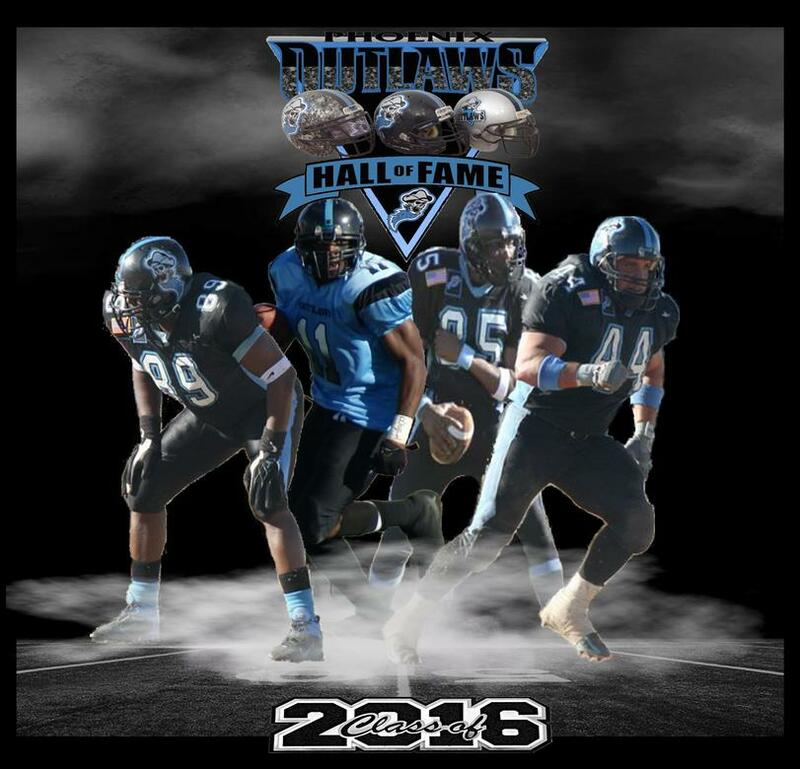 Respected and feared by every player and coach in Arizona Amateur football. #12 - BRIAN FIERROS: Brian was another original Outlaw starting his tenure in 1999 and retired in 2002. Brian was the first quarterback in Outlaws team history and threw the first touchdown pass in team history in week five vs the Lightning. Handled the kicking duties in 1999 as well. Switched to widereceiver half way through the season and a star was born! When an injury to the next quarterback happened Brian was put back in at QB and at the end of the season he threw 4 touchdown passes in the playoffs against the Raiders that is still a team record. Brian's passing stats finished with 43 of 89 for 463 yards and 6 touchdowns. At widereceiver is where Brian excelled and became known as "Mr. Clutch". Made all the big catches in the biggest games. Finished with 58 receptions for 1,047 yards a 18.05avg. and 15 touchdowns. Kicked 5 extra points. True Outlaw who was the life and spirit of the team. Coaches original "utility infielder" because he could and did play every and any position. Class act who is loved by all. 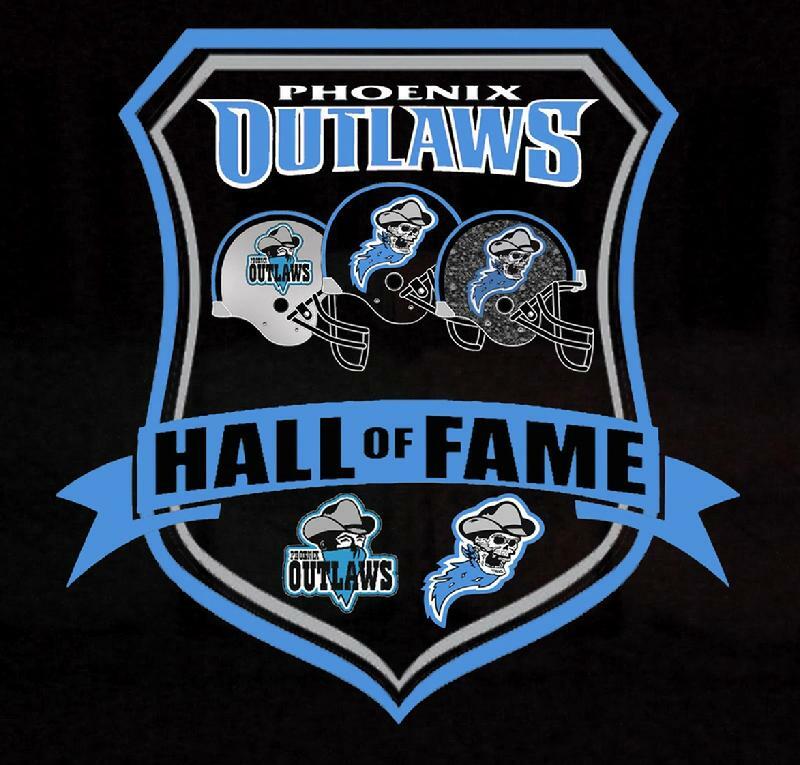 On September 10th 2005 the Phoenix Outlaws had their inaugural "Hall Of Fame" ceremony held at the Golden Phoenix Restart. For the first class inductees it was a special night full of great stories, food. laughs, and memories. The three men were rated the number one offensive line in Arizona Amateur Football during that time period. Named the "Three Amigo's" since they all played together at Tempe High School and stayed together with the Outlaws. Collectively they helped the Outlaws into the Championship game in only our second year of existence in 2000. We are honored to recognize the sacrifice made by these outstanding men and their commitment to the Phoenix Outlaws Football Club. #74 - STEVE QHIHUIS: Steve had the longest tenure of the "Three Amigos" by playing for the Outlaws for five seasons. Steve was the protector of the quarterbacks blindside and almost never gave up a sack. Solid, consistent, durable.. are all words to describe Steve, but they do not tell of his dedication and heart to this team. Steve is a class individual who embodied what the Outlaws represent in how to act on and off the field. Four time All-Star, as well as Outlaws player of the week. While the Outlaws were on our 5th anniversary cruise, Steve won an award on the ship and when the D.J. asked him if the people cheering for him were his friends... Steve replied "no, that's family". That is Steve and his love for the Outlaws! #77 - ROB SEVER: Rob was the first player to ever show up for an Outlaws practice. He had a style and technique all his own and made it pay off. An anchor who protected the passing hand of the quarterback. Produced massive consistent blocks in the running game. Rob is an Outlaw true and true, and represented the Outlaws Organization with class from start to finish. Will always be known for his destruction of a Phantoms player who after an interception was show boating in front of our bench and Rob... destroyed him for showing up his teammates and continued to drive that player into the next field. That helped set the swagger that the Outlaws would be known for from that point on. #73 - MATT BILLINGSLEY: Matt was the first player/coach in team history. He was responsible for all of the teams early blocking schemes and called the blocking at the line of scrimmage that helped get the Outlaws to the championship game in only our second year. Matt was a team leader who was respected by not only his teammates but his opponents as well. Was one of only three players to make All-League in the Outlaws first season. Matt was All-League and an All-Star in his first two seasons.Matt suffered an injury half way through his third season that unfortunately ended his playing days, but his style of play and what he brought to the Outlaws will always be appreciated.